Preheat oven to 350º F and prepare a cookie sheet for baking. Add bananas and lemon to a large mixing bowl (mash bananas if needed). Stir in oats, flour, chia seeds, flax, and salt and mix until combined. Use hands to form about 8 equal-sized balls of dough and spread on baking sheet. Use thumb to press a hole two-thirds of the way down the center of each ball and flatten slightly to form cookie shape. Fill center of each cookie with about a teaspoon of jam and place cookie sheet on the center rack of oven and bake until golden brown, about 15 minutes. Remove from oven and allow to cool slightly before serving. Looking for more holiday cookie inspiration? 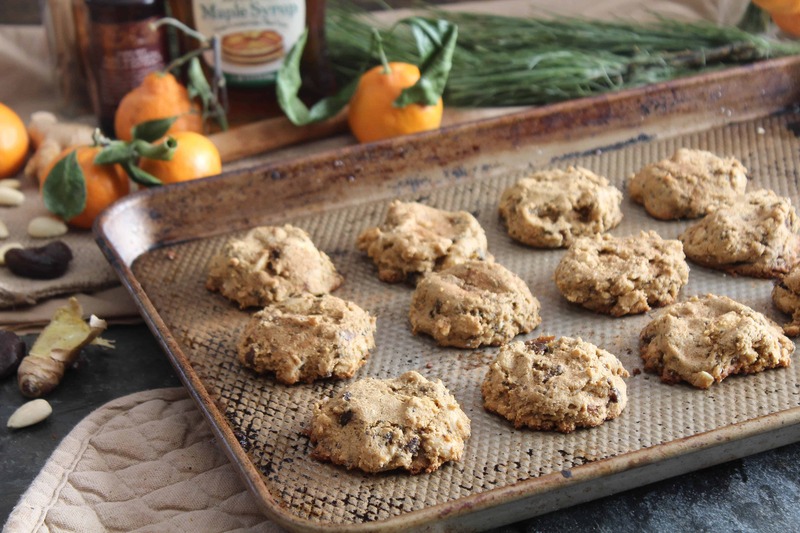 Try these One Bowl Whole Wheat Spiced Apricot Cookies! Yum! What a great option for holiday cookies, less guilt is always a plus during the holidays! If you’re going to make thumbprints, gotta use that homemade jam! These look so delish dear! YUM I currently have some leftover chia jam sitting in my fridge that would be perfect for these! Love the creativity. And that jam sounds amazing. Yum.